How Tough is a Pillow Tank? FAQ: How tough are pillow tanks? Question: How tough is a pillow tank? I am looking one of your pillow tanks or water storage bladders that can hold around 6,000 to 7,000 gallons of non-potable water. I would like to know if the tank is resistant to puncture? Does it need a base mat? We are looking to put the tank in fields where there are stickers and weeds. Can this tank work for this purpose? Answer: Thank you for contacting Portable Tanks, a division of GEI Works! I would be happy to provide you with some more information regarding a pillow tank (also known as water storage bladders). 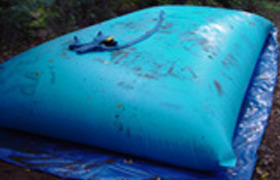 Designed for robust use and reliable water storage, these water bladders have been made from several different materials that often range from a 22 ounce to 40 ounce fabric material. This provides several different fabric options, including thicker options for areas looking for high strength. Sometimes our customers ask us questions like "Will they leak if shot?" or "Can a knife or pair of scissors damage the fabric?" These questions are hard to answer because it is often dependant on the environment and case-specific situations. While our products are made from tough and heavy-duty industrial fabric, they are not indestructible. If somebody wants to vandalize a product, they will likely find ways to do so. 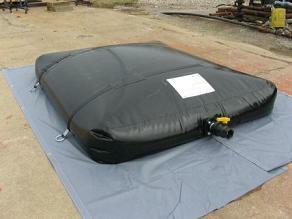 Berm Liner: This berm goes underneath the tank to help protect against abrasion. Berms will typically include high walls to help contain liquids. Ground Cloth: Additional options for this kind of protection includes a ground cloth. This can help additional line the area.